Retailers, restaurants, transport hubs, sports stadia, hotels, visitor attractions, corporate companies and others are investing in the latest digital signage technology and its content. But what exactly are digital displays? asks Paul Bray. What difference does a dynamic, electronic poster make compared with conventional marketing media? About 30 per cent in sales, according to upmarket tailor Hardy Amies. On Black Friday 2016 the retailer used a 70″ digital display in the window of its Savile Row store to run a promotion on outerwear. “The campaign run on the screen resulted in a direct increase in outerwear sales of 30 per cent compared with a similar promotion a few weeks before where the screen wasn’t used,” says Kashmir Cooper, EMEA channel director at Elo, which supplied the screen. 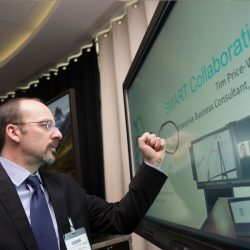 No wonder retailers, restaurants, transport hubs, sports stadia, hotels, visitor attractions, corporate companies and a host of other organisations are falling over themselves to install the latest in digital signage technology. But what exactly is digital signage? As the market matures, joined-up thinking is becoming vital. 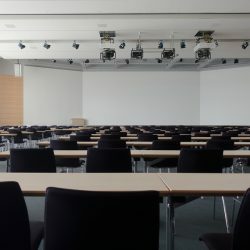 “It’s very much about a solution now, not just a display and other components, and vendors are positioning themselves as solution providers who can incorporate all the elements into a streamlined ecosystem,” says Graham Cooke, market analyst for professional displays at Futuresource Consulting. 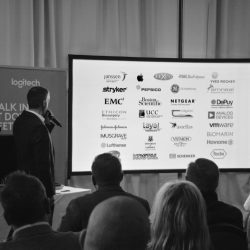 Digital signage solutions essentially divide into three main components, says Jason Shave, business development manager at integrator CDEC. “The content management system (CMS) is the main brain, responsible for the aggregation of schedules, visuals, data, triggers and connection to other third-party platforms or devices such as RFID readers, demographic analysis devices and SQL databases. “The second component is a media playback device. Typically this pulls content from the CMS over a network connection and stores it locally. At a specified time the content is then pushed to the right screen location(s) and played until the expiry time. The CMS schedules content to media playback devices based on the business rules you define. Media playback devices typically range from dedicated signage players supporting large, complex installations to simple, system-on-chip (SoC) solutions built into the display. PCs are also sometimes used. Smart displays with built-in SoC players have changed the signage market, says Cooke. 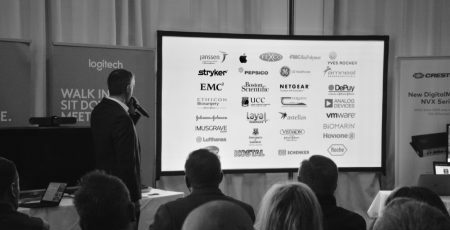 “This has been driven by Samsung and LG in particular, while other vendors such as Philips and Panasonic have opened the market further by launching Android based solutions, and NEC’s modular approach has created another smart option. Although large screen sizes are becoming more popular as prices fall, 40-59in still accounts for more than half of sales, according to Futuresource – partly because many applications, such as retail and transport, lack the physical space for larger screens. Many floor-level displays are moving to an interactive format, enabling businesses to offer a tailored or personalised experience for users, says Mark Childerhouse, senior account manager at Pioneer. When it comes to resolution, 1080p Full HD remains dominant, says Cooke. 4K displays only accounted for four per cent of sales by the end of 2016, and many buyers feel there’s no compelling case to trade up yet. “The cost (not just the screen but associated costs of content, signal distribution and storage) is still prohibitively high,” he says. 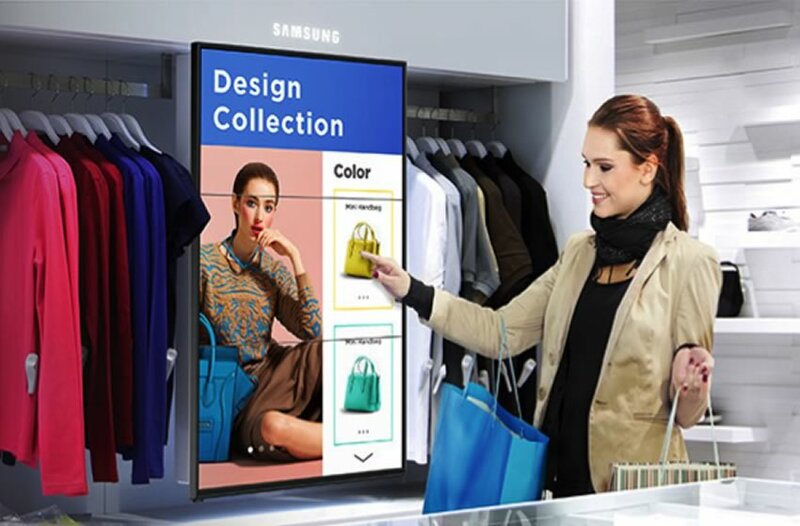 Niche display technologies such as mirrored displays with inbuilt augmented reality or the new OLED transparent displays are worth considering as ways of differentiating your signage from the shop or business next door, adds Cooke. 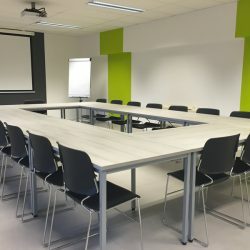 For large display areas projectors are a cost-effective solution, says Botao Lin, director for collaboration products at Vivitek. Traditionally their colour reproduction wasn’t as good as LCD panels or LED, but with laser technology projectors achieve excellent colour reproduction and a lifespan of 20,000 hours. “Advances in LED and OLED screen technology have stimulated far more interesting curved display surfaces that literally wrap around physical objects, helping with immersion and wow factor,” adds Samuel Recine, director of sales, Americas and Asia Pacific, at Matrox Graphics. LED also tends to dominate sales of outdoor display walls because its high brightness can compete with strong sunlight, says Lin. Many of the better CMS platforms have an easy-to-use designer element for building simple screen layouts, although hackneyed, standard designs are best avoided, he adds. Signage solutions are having to cope with increasingly sophisticated content. Audience measurement tools can help assess the effectiveness of the content being shown. “An integrated camera can log useful data such as the gender and age of the user, how long they interacted with the signage or when they decided to stop using the screen,” says Cooper. And, of course, you need to grab people’s attention. 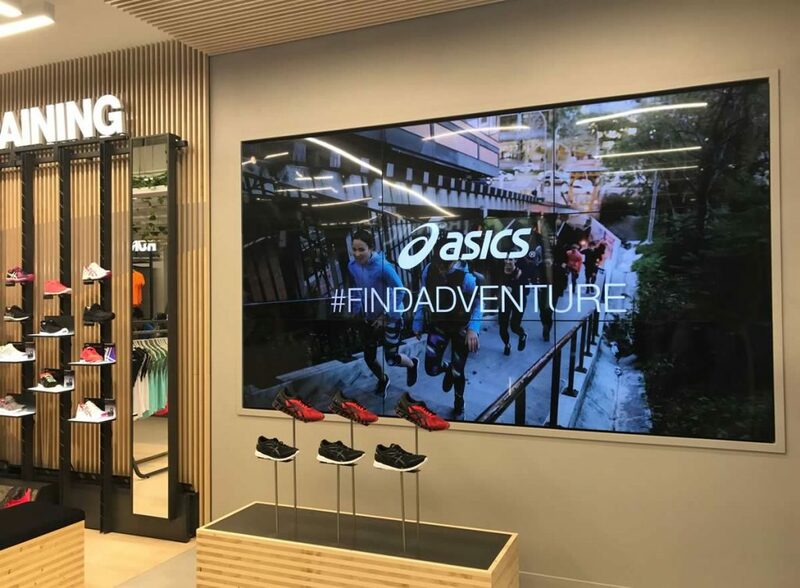 “Engaging viewers is the single most important element of a digital signage network, because if viewers aren’t engaged then the solution has failed,” says Shave. Audio, for example, may be triggered as a potential customer passes a shop window. Other triggers could include RFID tags, NFC readers, barcode scanners, BMS system, touch screens and demographic cameras. Before long retailers will be able to align consumers’ online shopping preferences with their experience in-store. “If a customer has shown interest in a product online, it will be possible to project that product on to a display when they visit the store,” says Childerhouse. A recent revamp of Bank of Ireland’s branch at Dublin City University incorporates a digital signage system from BT Ireland and RMG Networks. 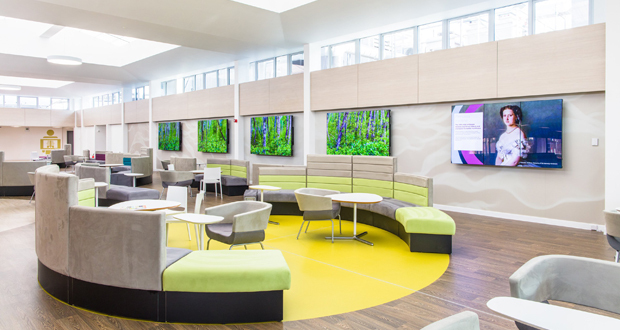 It combines two video walls, comprising three and six 75in flat panel displays, with smaller touch screens that switch to displaying signage content when not being used interactively. Content is delivered in real time direct from the bank’s data centre via RMG software, prioritised over the network to guarantee performance. Central control enables, for example, a prime time TV advert to be aligned with next-day messaging in branch. “Traditional posters only provide one message, but a digital screen delivers far bigger frequency of message from the same footprint, and can be targeted by location, time of day and audience profile,” says Bank of Ireland’s head of marketing, James Munnelly.